Proforma of RRB NTPC Medical Eye Test Certificate for Traffic Apprentice (TA) & Goods Guard - Download Eye Vision Certificate to be obtained from an Eye Specialist: Looking for Eye Test Certificate format? Since couple of days, a large number of candidates are asking for Eye fitness certificate format for RRB NTPC, Eye Vision Test format and more about RRB NTPC Medical Test. Download RRB NTPC Medical Certificate for Goods Guard & Traffic Apprentice posts. As we all know that RRB NTPC Final Result and list of shortlisted candidates for appearing at Document Verification for ASM, Guard, TA, CA, Clerk and Traffic Asst posts have been published shortly. In the meanwhile candidates are gearing up RRB NTPC DV where candidates have to bring Medical Certificate obtained from an Eye Specialist. To solve this problem, here we have come up with RRB NTPC Medical Certificate format form which is format of Medical Certificate for Goods Guard and Traffic Apprentice posts. 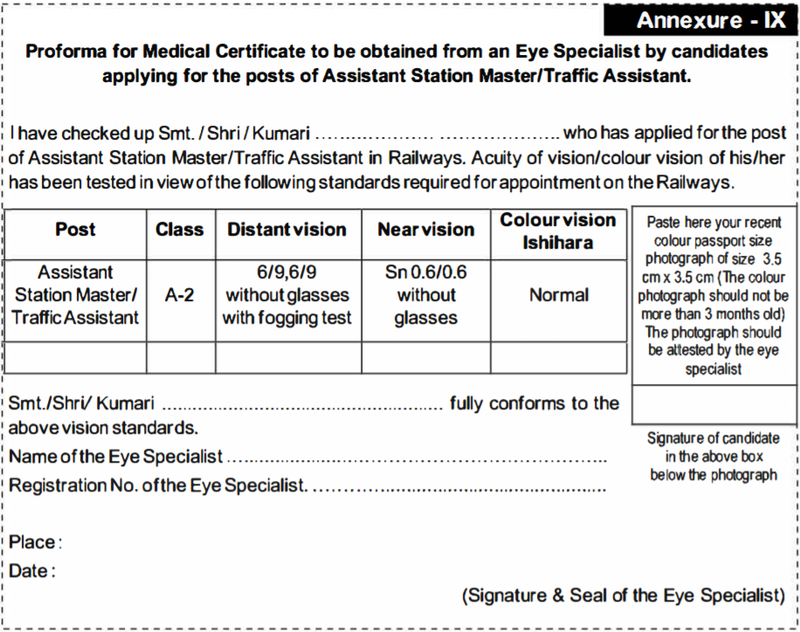 All those candidates who are called for RRB NTPC Document Verification, they will need to bring Medical eye fitness certificate obtained from any Eye Specialist. The Railway Recruitment Boards (RRBs) have made RRB NTPC Medical Certificate available in the form of Annexure IX. Following Test will be conducted at RRB NTPC Eye Vision Test. # No glasses are to be permitted at the time of initial recruitment of ASM, Traffic Assistant, Goods Guard and Traffic Apprentice posts. # During Medical examination of candidate, the use of contact lenses is not to be allowed. # Lasik/ Laser/ Radial Keratotomy or any other surgical treatment for eye vision correction will make you unfit for A-2 Category posts. The Medical Test format for ASM posts is same for each Railway Boards/ Zones. The above mentioned RRB NTPC Eye Vision Certificate format is for all Railway Recruitment Board (RRBs) including RRB Ahmedabad, RRB Ajmer, RRB Allahabad, RRB Banglore, RRB Bhopal, RRB Bhubaneswar, RRB Bilaspur, RRB Chandigarh, RRB Chennai, RRB Gorakhpur, RRB Guwahati, RRB J&K, RRB Kolkata, RRB Malda, RRB Mumbai, RRB Muzaffarpur, RRB Patna, RRB Ranchi, RRB Secunderabad, RRB Siliguri and RRB Thiruvananthapuram. RRB NTPC Document Verification (List of Certificate). RRB NTPC Certificate Format for DV.